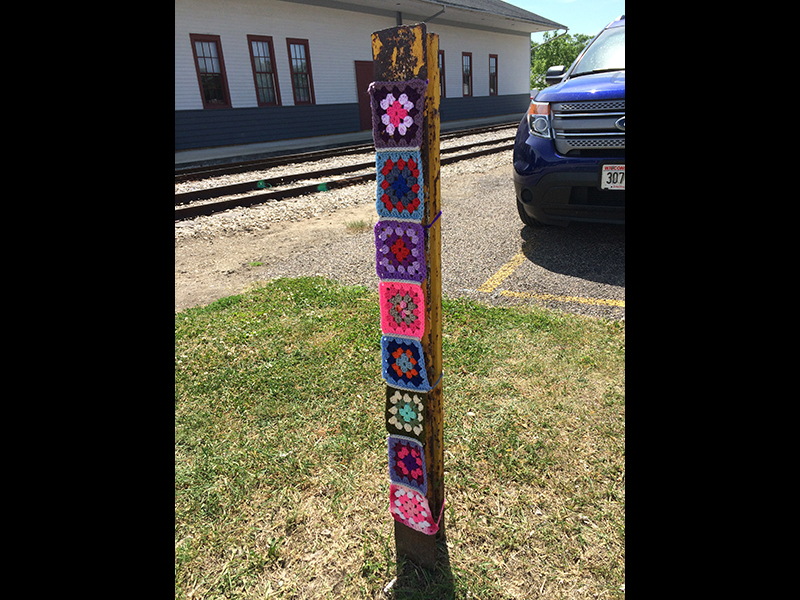 “Why are you doing that?” asked the woman who slowed up and rolled down the window of her truck as I sewed crocheted granny squares to a post in my hometown of Mazomanie, Wisconsin. “We’re decorating the downtown area” I explained. I explained that yarn bombing is an international phenomenon and that we were doing it to highlight a handwork exhibit being displayed at the Mazomanie Historical Society Museum. I could tell, as she rolled up her window and drove away, that she was still confused. I’d been seeing that look a lot. 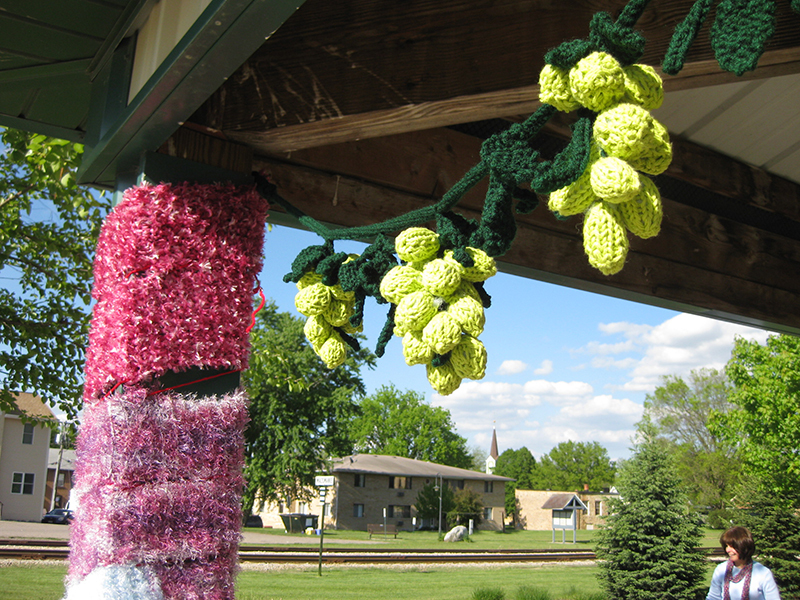 Over a week earlier, I was part of a group who affixed knitted, crocheted and woven pieces to trees, benches and posts; dangled grapes from a park shelter roof; and wrapped both the large flagpole base and the flagpole with a long knitted sampler and granny squares. We timed the display to coincide with the exhibit titled “A Sampling of Needlework and Textiles” and enlisted fellow fiber artists to create pieces that could be sewn or fastened to public fixtures to provide color, texture and interest to the area around the museum. Our (almost) fearless leader talked with the village president, village clerk and local police before the work was started to make sure we wouldn’t be arrested or anything. 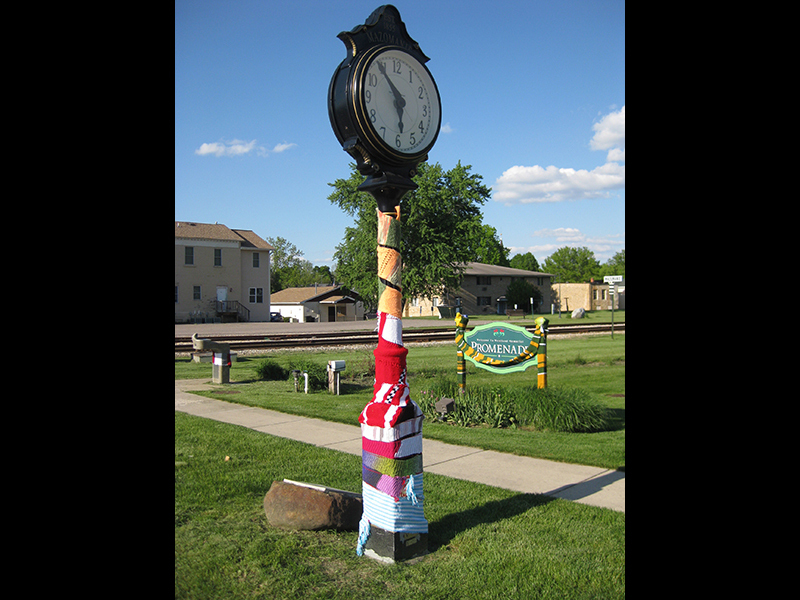 We know that yarn bombing is often done at night as a surprise, but we didn’t trust ourselves on a stepladder in the dark and we don’t get out much at 2:00 a.m. these days, so we did it in the afternoon. Even with the officials’ blessings, we ran into some opposition after the bombing was done. A local individual who volunteers at the park where much of our art was displayed reported that he received complaints, so he requested that we move some pieces. 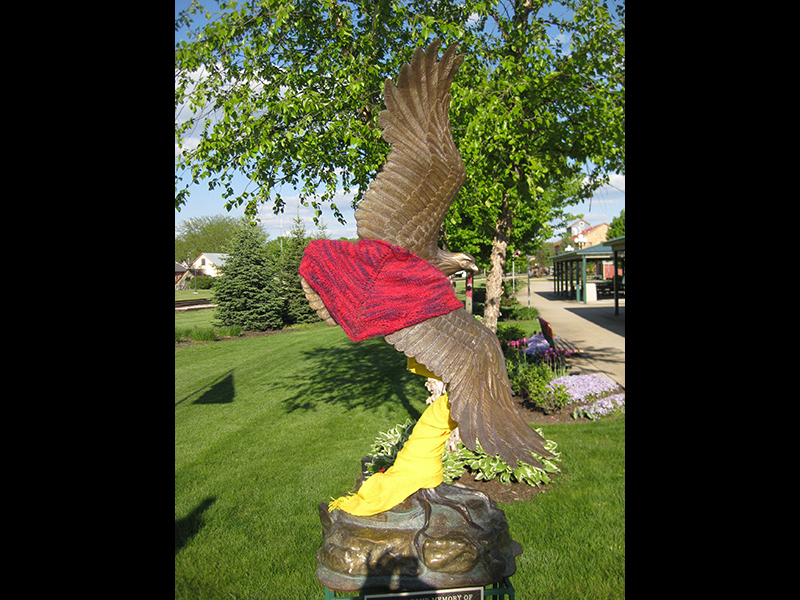 Apparently it’s “disrespectful” to put a shawl on an eagle statue. That certainly was not our intent. Another individual told me that she finds the display “distracting”. I told her I’m glad to know it’s being looked at. Thankfully, there has been much more positive reaction than negative. The morning after we put it up, someone posted a photo to a local Facebook page with the comment “Loving the yarn-bombed flagpole and other artistic downtown enhancements today!”. Others commented “Just making Mazo even more awesome!” and “This is what that yarn is all about! smile emoticon pretty neat!”. Many others have told us that they love the colors and think that it’s a great addition to the downtown area. My grandniece reported that the kids on her school bus have been looking at it and talking about it. 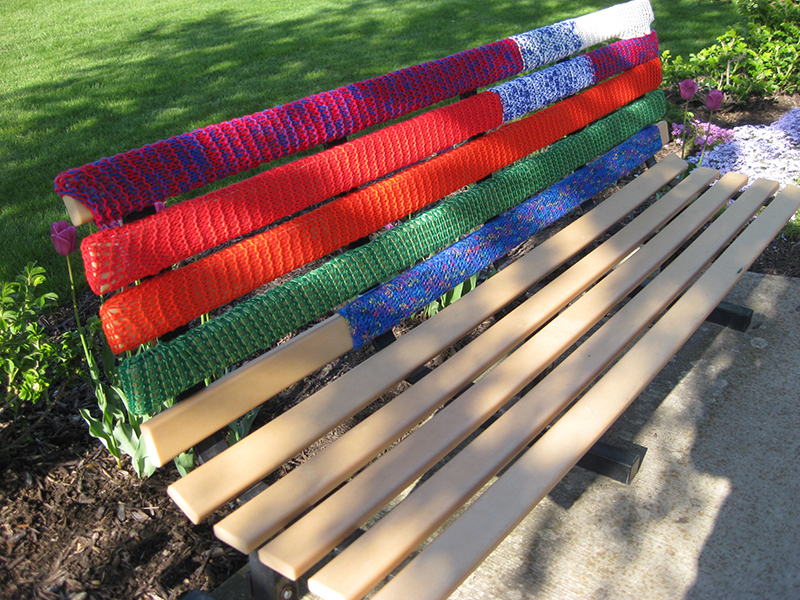 We initially stayed in public areas but a number of businesses have let us know that we’re welcome to yarn bomb them. Sadly, someone took unauthorized action against our yarn bombing and removed most of the pieces, possibly in the dead of night. 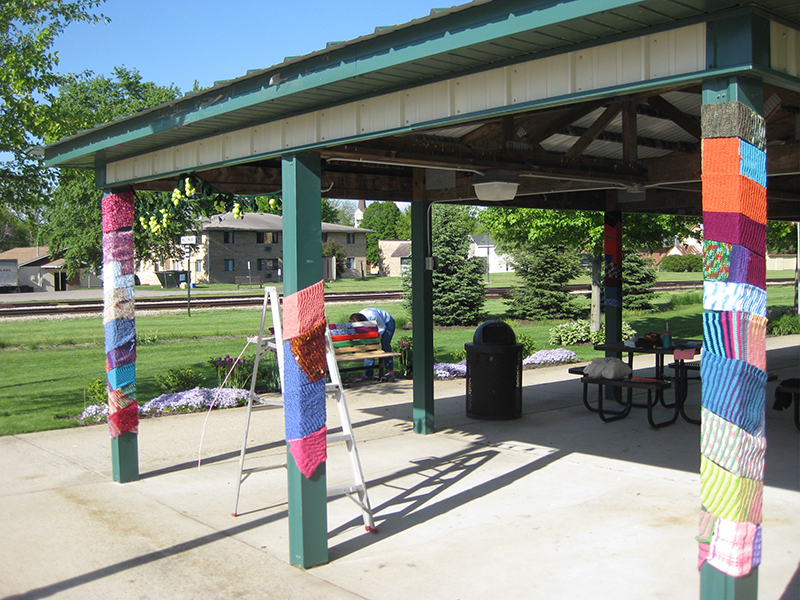 When the Mazomanie Fire Department members began to prepare for their 150th anniversary celebration at Mazomanie’s Promenade at 6:00 a.m. on Saturday, June 18th, some noticed that the yarn bombing pieces were missing. A majority of the pieces that had adorned a bench, the clock, and the shelter had been taken down, along with the pieces that were around the flagpole. Although our police continue to investigate, we don’t know who took the artwork. Someone went to a lot of effort to commit an act of vandalism and they were pretty neat about doing it, since no pieces were strewn around. We had planned to give the pieces to the museum when we took them down at the end of the season. 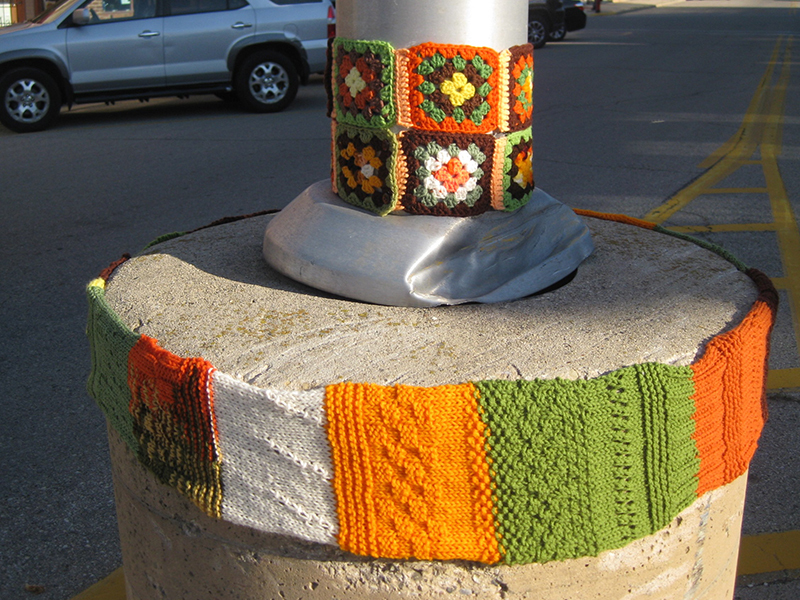 We didn’t expect that everyone would love the yarn bombing and we hoped for comments from the public. Isn’t that a major part of what art is about – stimulating thought and conversation? 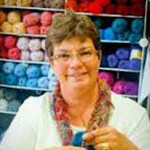 And make no mistake about it, knitting, crocheting and weaving are arts and not just crafts or hobbies. We can use our skills to keep people and even animals warm and also to decorate and provoke comments. Apparently we can also use our skills to tick some people off, however unintentional that might be. From this Seed We Will Grow What’s Next for CKC?